Men’s Team: Tiffin won the national team title, their first in program history, scoring 49 points for the crown. It came down to a wild 4×400 relay where the Dragons needed eight points or more for the national crown. Lamar Hargrove who won the 200 and was runner-up in the 60 earlier, was added from the alternate pool to the team’s relay squad. They won the first section in 3:10.59 to set the “clubhouse” time, but had to wait for three more sections to see if the time held. Lincoln (Mo.) knocked Tiffin’s time down to second in the order in section 3 via a 3:10.44 run. In section 4, as the clock ticked to 3:11+, the infield erupted in cheers from the Tiffin crew as they knew a national team title was theirs. Adams State (47) was second, Academy of Art and Lincoln tied for third (39). Men’s Scorers: Hargrove and Adams State freshman Sydney Gidabuday were the men’s top point scorers with 20 points. Gidabuday swept the 3000 and 5000 meters while Hargrove won the 200 meters, took runner-up honors in the 60 meters, and was a member of that clutch 4×400 relay crew that claimed second-place honors. Men’s 60 Meters: Academy of Art freshman Mobolade Ajomale wins in, an upset at 6.57, recording the division’s best time since 2003 and tied the second-best clocking in meet history. It is Academy of Art’s first-ever title in the event. Two-time defending champ, Lamar Hargrove, of Tiffin, two-time defending champ finished runner-up in 6.66. 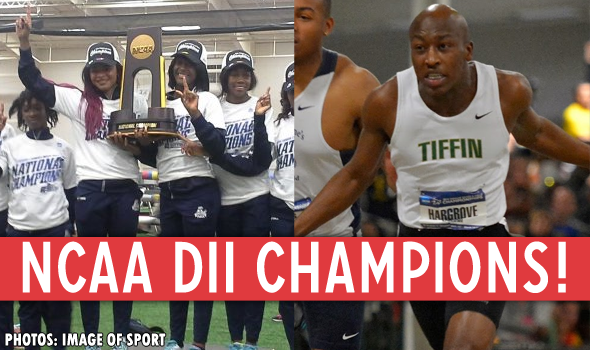 Men’s 200 Meters: Lamar Hargrove of Tiffin not only won his third-straight national indoor crown at the distance, but he also won his fifth NCAA indoor national title — an NCAA Division II career record for individual-event titles. Along with the three 200 meter crowns, Hargrove has national titles in the 60 meters from 2014 and 2015 to his credit. This year, he won in 20.81, edging out 60-meter winner, Academy of Art freshman Mobolade Ajomale who clocked 20.82. Men’s 400 Meters: Jordan Edwards of Academy of Art defends his title becoming the first to go back-to-back since Saint Augustine’s Josh Scott (2009-2010). Edwards won from section 1 in a time 47.02, as freshman runner-up Faedeon Royes of Lincoln (Mo.) was just a hundredth behind in 47.03 in winning section 2. Clafilin freshman Brandon Valentine-Parris was just hundredth behind that in 47.04. Men’s 800 Meters: Texas A&M-Commerce junior Luis Romero with the win in 1:48.75. Colordo Mines’ Patrick Weaver was runner-up in 1:48.90. Men’s Mile: Oliver Atchison of Adams State defended his title, passing for the tape in the last 30 meters to win in 4:12.69. He is the first to win back-to-back since fellow Grizzly Aaron Braun in 2009-2010. Black Hills State’s Alec Baldwin was runner up (4:13.34). Men’s 3000 Meters: Adams State freshman Sydney Gidabuday is the first in meet history to win the 3000 and 5000 meters at the same indoor Division II championship. He took the 3k crown in 8:23.13 ahead of Tiffin freshman James Ngandu. Men’s 60 Meter Hurdles: Minnesota State’s Myles Hunter defends his title, topping his own division and championships records with a collegiate-leading clocking of 7.53. He is the first back-to-back winner in the event since Decosma Wright of Lincoln (Mo.) (2006-2007). The 7.53 enters the all-time collegiate top 10, regardless of division. For perspective, Hunter’s time was better than the winning run at the DI championships held moments later by Oregon’s Devon Allen (7.56). He also set a new meet record in the semifinals Friday, 7.67. Hunter now holds the four fastest times in division history. Runner-up Javier Lopez of Texas A&M-Kingsville (7.69) moves into a tie as the No. 2-fastest performer in meet history. Men’s 4×400 Relay: Lincoln (Mo.) won in 3:10.44 over Tiffin’s 3:10.59 from section 1. More on the 4×400 relay in the team notes section. For Lincoln, it was their first event title since 2003. Men’s High Jump: Texas A&M-Kingsville’s Jeron Robinson won the day and was the only to clear seven feet or better. His best was 7-3 (2.21m), but he took attempts at the DII championships and all-time division record, 7-7 (2.31m). Men’s Pole Vault: Texas A&M-Kingsville senior Jordan Yamoah won the crown as the only to clear 17-9 (5.41m). Yamoah, who won the national indoor title for the third time, took meet-record attempts at 18-1¼ (5.52m). Central Missouri junior Cole Phillips was runner-up at 17-1 (5.21m). Men’s Triple Jump: DeVonte Steele of Texas A&M-Commerce took the lead in round five with a jump of 52-9 (16.09m) and hung on for the title. The mark moves him into the top 10 in division history. Not only is it TAMU-Commerce’s first title in the event, it is the first in men’s program history in any indoor event. Men’s Shot Put: Pittsburg State’s Garrett Appier won the title by over two feet with a meet-best, third-round throw of 61-11 (18.87m). It’s the Gorilla’s first title in the event since 1995 (Ryan Keith). Defending champ Lake Superior State’s Justin Dieck was the runner-up (59-6¾, 18.15m). Men’s Heptathlon: Last year’s runner-up as a freshman, Azusa Pacific’s Shakiel Chattoo won with 5,554 points. He held off Pittsburg State’s Tanner McNutt who finished just 15 points behind despite a three-bar improvement to his pole vault PR and a 16-second advantage in the 1000. Division-leader Jayce Thomas of Missouri Southern finished fourth (5477). Women’s Team: As with the men’s team race, the women’s hedged on the result of the 4×400. Lincoln (Mo.) entered eight points behind Hillsdale, 58-50, and needed a win or second-place showing for a national team title. The Blue Tigers pulled through, running a division all-time best time and meet record, 3:38.87. The time surpassed the previous all-time best set by Lincoln to win the NCAA title in 1997. Women’s Scorers: Salcia Slack of New Mexico Highlands scored 23 points to earn high-point scorer honors. Slack won the triple jump and pentathlon on Saturday to go with her sixth-place performance in the long jump Friday. Women’s 60 Meters: Queens (N.C.) sophomore Nikia Squire won in 7.32 for the program’s first national crown in any indoor event. Women’s 200 Meters: Lincoln (Mo.) senior Yanique Ellington won in 23.62, just ahead of teammate Venicha Baker (23.65). Ellington defended her title, and is the first to do so in the event since Lincoln’s Semoy Hackett in 2009 and 2010. Women’s 400 Meters: Merrimack’s Carly Muscaro won from section 2 in 52.34. Muscaro was the runner-up a year ago to defending champ and runner-up in this meet, Ayana Walker of Shorter who clocked 52.86. Women’s 800 Meters: Cedarville sophomore Carsyn Koch won in 2:05.12, 2.4 seconds ahead of Lynelle Decker of Seattle Pacific. It is the first national title for Cedarville in indoor women’s track & field as an NCAA Division II institution. Women’s Mile: Hillsdale senior Emily Oren won the crown by two seconds, clocking 4:35.48 to win the school’s first title in the event since 2012. Minnesota-Duluth sophomore Emilee Trost was runner-up in 4:37.57. Women’s 3000 Meters: Oren covered the 3k distance in 9:27.98 to defend her national title in the event. Not only that, but she became the first in DII women’s meet history to sweep the mile and 3000 meters crowns. Hillsdale went 1-2 as senior Kristina Galat was runner-up. Women’s 60 Meter Hurdles: Freshman Chrisdale McCarthy of Lincoln (Mo.) takes the crown, winning with a time of 8.37. Teammate and defending champion Ladonna Richards placed third while Minnesota State’s Altoniece Williams was runner-up (8.42). Women’s 4×400 Relay: See women’s team notes for Lincoln’s winning story. Johnson C. Smith was second in 3:39.91. Women’s Triple Jump: New Mexico Highland’s Salcia Slack claimed the title and led throughout the competition. Her best of the day in round 5 of 42-3¼ (12.88m) won her the title, but it came at a cost. Slack injured herself and needed immediate medical attention that required a stretcher and an ambulance. The incident delayed the final round of the competition by 20 minutes. There’s no official word to the extent of her injury. In that final round, there was a reshifting of order for second and third as Lewis freshman Cierra Pulliam moved up to the runner-up spot while a response by Clayton State senior Jessica Matthews was enough for her best-of-the-day, it was not enough to jump back the second-place spot. Women’s Pentathlon: New Mexico Highland’s Salcia Slack defends national crown, scoring a division’s season’s best 4,172 points for the win. The mark was just 21 points from the meet record and is the No. 3 performance in division history. Slack has now scored 4000-or-more points four times in her collegiate career. Men’s 60 meter hurdles (semis): Minnesota State’s Myles Hunter sets new championships record with a run of 7.67 in the semifinals. Men’s 5000 Meters: Adams State freshman Sydney Gidabuday won the title in 14:06.09, just two seconds ahead of Grand Valley State junior Bryce Bradley (14:07.93). The top four spots were separated by less than five seconds. Adams State last won the event in 2010 (Brian Medigovich). Men’s Distance Medley Relay: The top six teams all finished within 2.21 seconds of each other in a dandy of a race. American International was the victor, claiming their first-ever title in the event, in 9:48.02, finishing ahead of West Texas A&M (9:49.24) and Black Hills State (9:49.67). Men’s Long Jump: Round six produced an immense amount of drama. Louis Rollins, a freshman for host Pittsburg State, held the lead before the sixth round via a fourth-round leap of 25-8 (7.82m). Chadron State’s Damarcus Simpson surpassed the then-leader with a 25-11 (7.90m) performance to become the new leader. Then sophomore Sedeekie Edie on Lincoln (Mo.) took to the runway and leapt beyond the first-place marker, landing at 26-1¾ (7.97m) to not only win, but hold a new special place in the record books. Edie broke the 1989 championships record held for 27 years by Saint Augustine’s Terrell Carpenter. Edie also moved to No. 3 all-time in the division and has the best mark in DII since 1991. Men’s Weight Throw: Ashland’s Jordan Crayon took the lead in round four and delivered the Eagles’ seventh title in the past 11 years of the event. His best of 71-6¾ (21.81m) was ahead of Central Missouri’s Caniggia Raynor’s 70-10 (21.59m). Women’s 5000 Meters: Lewis junior Amanda Farrough took the crown (16:09.10) in a good race over Alaska Anchorage’s Joyce Chelimo (16:10.32). The duo’s times are the second and third best in meet history. It is Lewis’ first title in the event since 1997 (Kasia Arient). Women’s Distance Medley Relay: Anchored by Emily Oren, Hillsdale defended its national event crown with the second-best time in meet history, 11:24.39. Minnesota-Duluth claimed second with the third-best time in meet history, 11:26.86. Adams State took took third (11:28.53). Women’s High Jump: Southwest Baptist’s Natalie O’Keefe won with clearance of 5-8¾ (1.75m). It is SBU’s first-ever women’s indoor title in any event. Women’s Long Jump: Chadron State’s Stachia Reuwsaat and Queens (N.C.)’s Nikia Squire takes first and second, respectively, with meet bests of 20-4½ (6.21m). Squire equaled Reuwsaat’s best in round six, but Reuwsaat’s second-round mark of 20-1¾ (6.14m) broke the tie. Her crown is Chardon State’s first national women’s indoor title in any event. Women’s Weight Throw: New all-time DII best and championship record for Winona State sophomore Kaitlyn Long, 74-5¾ (22.70m), produced on her first attempt. Central Missouri’s Heavin Warner was just a centimeter off her PR for second, 70-8 (21.54m). PROJECTIONS: Can Anyone Catch Cheserek & the Oregon Men?